And Why Do People Get So Crazy?! Black Friday is the day after the American Thanksgiving holiday, and the official start of the holiday shopping season in stores. Crowds of people flood into physical shops and online stores to get discounts and deals on gifts (and gear for themselves). It's easier to battle monsters than rabid shoppers! There are a lot of rumors about where the name came from, but according to the internet*, it began with Philadelphia police officers, bus and taxi drivers who knew that massive amounts of people would cause traffic jams across the city. Having seen people camping outside stores yesterday and driven through crowds of people fighting to get into parking lots today, I completely agree! * Always check facts you find on the internet. These seem pretty well-documented, though. 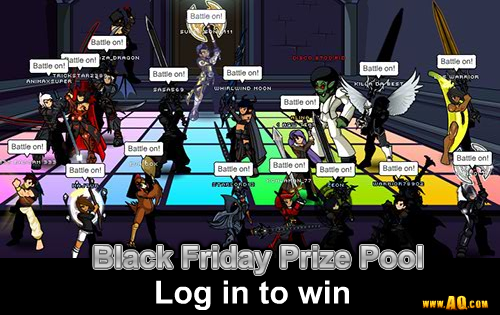 Log In to AQWorlds on Black Friday to Win! You like to play AQWorlds, and we like to reward you for playing it! Because Black Friday is a day to have fun running around hunting for extra-special deals, we wanted to do something crazy, too! Grab your friends and get to battling! We will hold this same drawing on Cyber Monday, but with a different prize going to 100 different people! Prizes will be awarded later this week. * You only need to log in once to enter, and each account can only be entered once. Get the darkest gear of the year this weekend! 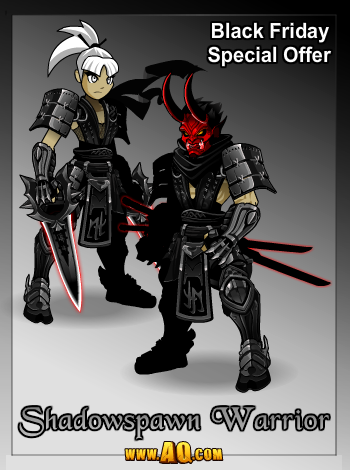 Head to Battleon and talk to the Shadowspawn Warrior to access the Black Friday shop (or find it in your game menu) and be the first in line to get our ShadowSpawn Warrior pre-Black Friday special offer! Then celebrate Thanksgiving with family and friends by taking down the Turdrakolich in our Harvest event. Embrace the Darkness with the ShadowSpawn Warrior package! Before the madness of Black Friday, there is Thanksgiving, a day of feasting and fun! But last night we're launching our 2013 Harvest Fest... and the ShadowSpawn Warrior Black Friday special offer! If you can't stand the heat, get out of Oishii's killer kitchen this Harvest! You know it's time for FOUL play, because a dark and undeadly creature is out for revenge, gearing up to tear down Oishii's kitchen. Her dream of having the best Harvest Fest ever is in danger... but so is her life and YOUR dinner! /Join Killerkitchen to begin this year's Harvest Fest event! Help Oishii create the best feast EVER... and save her from the Undead Turdraken (a Turdrakolich, of course!) who has come back to seek revenge for serving him up to last year's guests! So hot you 're in danger of catching fire! You'll find the Turdrakolich Rares shop filled with super-spicy, extra-hot gear, like the Beast from Below (rumor has it the creature lives inside Oishii's over O_O!!!! ), the Turdrakolich Hunter, and more! Log in on Black Friday for a change to win one of 100 exclusive shadow weapons! Then, log in on Cyber Monday for a chance to win 1 of 100 exclusive cyber weapons! ALL you have to do is log in... but while you're here, check out all the new releases! The Turdrakolich knows what you ate last harvest! Check out tonight's other releases! Shadowspawn Warrior package releases at 11:59 PM server time tonight! You can now buy 30 more inventory spaces! Use Ultimate Game Cards to upgrade or buy ACs in AQW now! Black Friday and Cyber Monday shops go live in just a few days! Check back tonight for gear previews! For this week only, you can get 1000 AC and the Amazon Warrior Armor for only $2.99 USD at the Amazon.com website. You can use credit card and also Amazon.com gift cards found in many grocery stores in the U.S to buy stuff at Amazon. Poll: What Changes do YOU want to see in AQW? If there were ANYTHING about AQWorlds and how it works you could change,* what would it be? Send us your ideas on Twitter, the forum, or Facebook! We are building AQW for and WITH you! We build AQWorlds with and for you guys, and every week we take your suggestions and ideas and add them into our releases. There are a lot of things that many of you want to see change, so let's work together to MAKE THEM HAPPEN! Let's get YOUR ideas in-game! There are MASSIVE changes we want to make that involve rewriting large parts of the game (which means they will not happen quickly), but they're worth doing if they help improve the game! We will try to get as many of them done as is humanly (and undeadly?!?!) possible! We are adding 30 more buyable inventory slots! Feel like your backpack is a little cramped? Is your bank full to overflowing? We have heard your cries of pain in the game, on Twitter and Facebook, and on the forums! Well, get ready for GREAT news, because tonight we are adding 30 MORE buyable inventory slots for 200 ACs each! 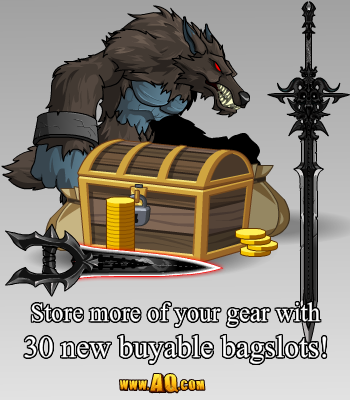 Click on the "Add Space" button in your inventory window or north from Battleon up to the Bank (next to the Guardian Tower) and talk to Augold the Banker to buy more slots! You Said You Couldn't Add New Spaces!?! You are correct, disembodied collective player-voice! We get asked for more spaces every day on Twitter, the forum, Facebook, and in-game. We have to be VERY careful about how often we add more spaces to avoid increasing lag. Making extra inventory spaces cost 200 ACs each also offsets the cost of the increased strain on our servers. The Shadowspawn Warrior Black Friday special offer is available now! Check out all the details in these Design Notes! Starting this Wednesday at 11:59 PM server time, buy any of the following packages to unlock the full ShadowSpawn Warrior set! The set will be available until at least Cyber Monday (December 2, 2013). After that, it may leave at any time! and a character page badge! Celebrate the Harvest with a Bounty of Rewards! This Wednesday, it's time for FOUL play! A dark and undeadly creature is out for revenge, gearing up to tear down Oishii's kitchen. Her dream of having the best Harvest Fest ever is in danger... but so is her life and YOUR dinner! Oishii's thankful for Lore's heroes! Thanksgiving is a time to tell what you are grateful for... and WE are grateful for all of you who play and support AQWorlds! Take a look at what else is on the menu for this week! Pre-Black Friday BlackJack special offer goes live Wednesday! Pre-Black Friday merge shop and quests go live Wednesday! Black Friday shop goes live at 12:01 AM on Friday! Cyber Monday shop releases at 12:01 AM this Monday! Your Legendary Passport to Adventure! Our players are all over the world. 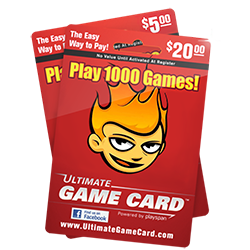 The Ultimate Game Card is available all over the world. So you should use the Ultimate Game Card to unlock exclusive Legend features inside AdventureQuest Worlds! Ultimate Game Card is your ultimate way to become an Upgraded Legend in your favorite online adventure game. And you can get this card practically anywhere! Click here to find a UGC vendor near you! Now's the time to grab a handful... with the holidays coming up, they make GREAT gifts for you OR your friends! Give the gift of gaming and BATTLE ON with all your best buds! We DO still have our AE game cards at CVS, and if you're lucky, you'll be able to snag one of the last cards at Target and Toys R Us before they fly off the shelves for good! Begin the 13th Lord of Chaos Saga Tonight! Begin the EPIC 13th Lord of Chaos Saga this weekend and unlock a portal to the Chaos Realm, create a guidestone, then battle your way to the heart of Drakath's Lair! The Champion of Chaos is waiting! How to Begin the Adventure? 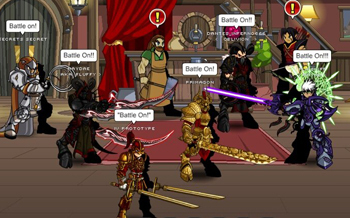 /Join nexus and talk to Warlic! If you've completed the Prologue and done Gravelyn's quests in Shadowfall, you'll see Warlic and the Chaos Portal on the top of the Nexus Tower. 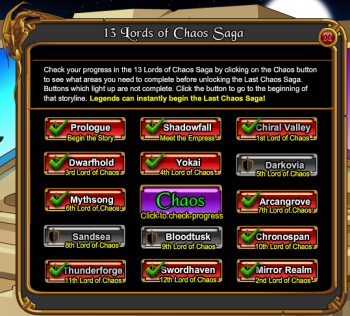 Once there, you'll need to have all 12 of the first Chaos Sagas complete OR have an upgraded account in order to start Warlic's first quest! Not sure how many you need to complete? Check your Book of Lore or Warlic's handy Saga Progress checker! Then begin his 1st quest to watch the first cutscene reviewing all of your adventures... and the start of the most INSANE journey you'll ever take! NOTE: Currently the progress checker does not show updated values for Bloodtusk or Mythsong. Check your Book of Lore for correct values. 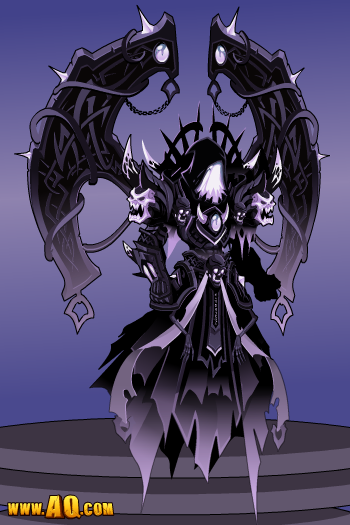 We promised you would confront Drakath, the Champion of Chaos, before the year was out, and you WILL do that tonight! But don't think the adventure ends here, Hero! Man, do we have a LOT in store for you in the 13th Lord of Chaos saga. Man, oh man, on MANY BATTLES ARE AHEAD!!!! We did not want to rush the next releases in this Saga, so rather than cram too much into a single month (and miss all of the things I'm about to miss next) we're going to continue the Chaos Saga after Frostval. 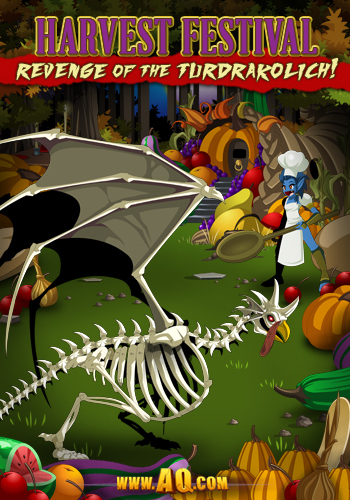 Next week, we've got the Turdrakolich event, then Frostval returns, Artix's wedding event releases, and our NEW Frostval content arrives: Nightmare Before Frost-EVIL!!! Once 2014 arrives, the Chaos is going to come fast and CRAZY! 50 years of Who? What? When? Where? Why? 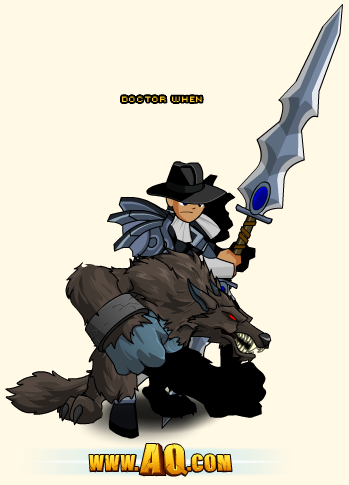 Talk to Quibble Coinbiter in Battleon or check your game menu to see our shop full of Doctor Who-themed gear AND all the new gear in Quibble Coinbiter's shop! Wishsticks and mustard for all! Here at the Lab, we LOVE us some timetravel, and when you throw in a dapper Doctor and a sweet (and sonic) screwdriver, you KNOW it's a show we're going to love! Since the beginning of the year, we've had TONS of Whovians asking us to do a tribute shop for the big premiere of the 50th anniversary episode this weekend... so of COURSE we did, and put our own spin on it! And remember, if you're going to live in a ZARDIS house, pick up an Ultrafez! It's the only thing tall enough to clean the ceiling! Harvest Fest and TWO Free Fortune Tickets! You've got a LOT to do this weekend, and once you've explored the realm of Chaos and confronted Drakath, /join harvest to take down the Turdraken! 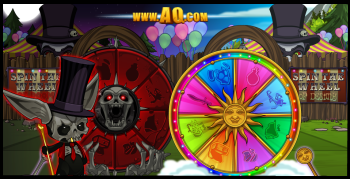 Then /join carnival and spin the Wheels of Doom and Destiny for a chance to get our newest item: the Hungry Werewolf pet! TWO FREE FORTUNE TICKETS?!?! You read that right. If your account has logged in within the last 30 days and is level 15 or higher, you got two Fortune Tickets for free! We awarded those earlier this evening. But there were SO MANY heroes to give tickets to, we could not do it all at once. So if you did NOT get your tickets tonight, you will receive them on Monday. 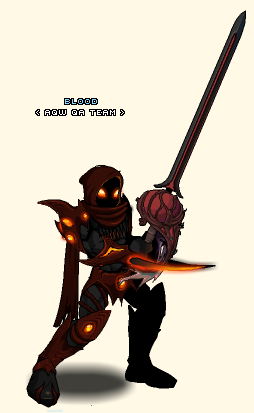 NEW Chaos Gear in Quibble's Shop! Chaos has its eye on Quibble Coinbiter, and you KNOW that means something big is going on! 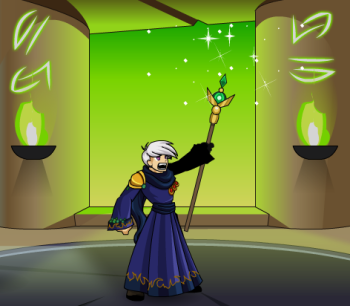 Check out the new Chaos and wedding gear in Quibble's shop before it leaves forever! Zorbak LOVES ebil. And track pants. 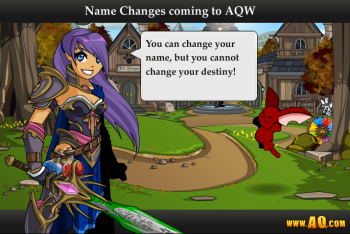 Reinvent Yourself in AQWorlds With a New Name! GREAT news, guys! We've been working behind the scenes to get a new feature working: in-game name changes... and it WORKS! 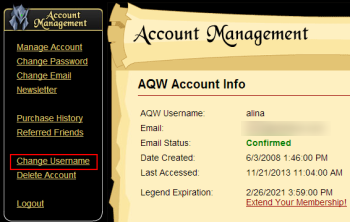 Starting NOW, you will be able to purchase a new name for your hero through the account manager for 2,000 AdventureCoins. Read on for more details and how the process will work! "Why 2000 ACs?" some of you are asking. We have a couple reasons for that. We don't want people to abuse the system by spamming name changes (which would hit the database pretty hard) or to deliberately confuse/harass other players. We look at your game name as your hero's identity; it is a big decision, selecting a new name, because names are important. It's who you are; it's who will save the world! 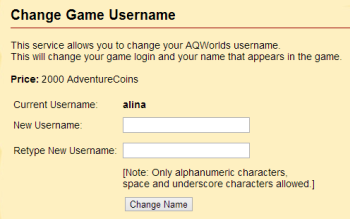 How to Change Your Name in AQWorlds! Type in the new name you want. If it is available, you will be asked to confirm your choice, then charged 2,000 ACs. If the name is not available, you will not be charged. Once you receive the success message, login to your account with the new username and your same password. Though we regularly clean up old accounts, we will be doing another huge "inactive account" purge before this goes live to free up more names. Once a name has been changed, the previous name CANNOT be taken for 30 days. This is to prevent accounts from being hacked to steal their name. Choosing a name with only numbers may cause bugs in the game. If you have any issues with your changed name (or any other name-related account issues) please use THIS help page! In a Hunger Game, only the most ravenous heroes survive... because they have a taste for VICTORY! Harvest Fest is BACK, and that means it's time for you to beat down the Turdraken and mash the monsters attacking the Cornycopia to earn a feast full of rewards! Then stuff your face AND your inventory with sweet gear to prepare for your battle against the Turdrakolich next Wednesday! Are you hungry for victory?! Harvest - Help Oishii, the Craziest Chef around! 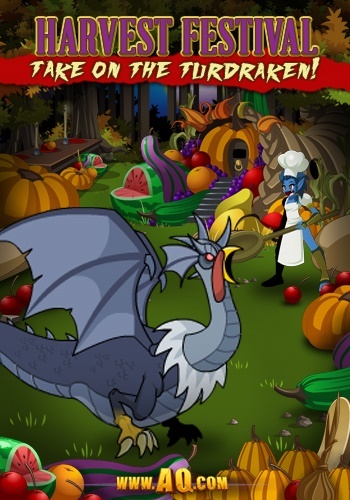 Turdraken - Take on the Turdraken for a deadly AND delicious battle! Float - Help Scott the Pilgrim save the Harvest Parade! FoulFarm - Something's foul in the Farmlands! The Sweetest Rewards Come with the Harvest! Once you're done gathering gear from the Harvest Fest, /join carnival to spin the Wheels of Doom and Destiny for our newest reward: the GIANT Hungry Werewolf! This 0 AC pet is only available until December 2nd! Tomorrow: Get TWO Free Fortune Tickets! We are thankful for all the heroes who play AQWorlds! That's why tomorrow we are giving ALL players who have logged in within the last 30 days AND are level 10 or higher TWO free tickets to spin the Wheels of Doom or Destiny! AQW's Nightmare Moglin Levels Up in Real Life! In Lore, you don't GET presents for your birthday, you GIVE them! And that's why you should head to Battleon now: Memet, AQW's assistant game lead, has a chest shop full of cutely-creepy (also terrifyingly-adorable if you are scared of dolls or clocks) gear to say thank you for playing AQW! Memet's apprentice, Blade, made her a very appropriately-scary gift! Memet started working for Artix Entertainment in the Player Support department... until we saw how amazing she was as an artist and kidnapped her! After Cysero transferred to the BattleGems team, Memet leveled up to AQW's assistant game lead, helping with art, writing, and release design. Prepare to face the Turdrakolich next Wednesday by stuffing your face AND your inventory with sweet gear TOMORROW! Login Thursday night to beat down the Turdraken and mash the monsters attacking the Cornycopia to earn a feast full of rewards! Then log in this Friday to unlock a portal to the Chaos Realm, create a guidestone, and battle your way through the Chaos Realm to the heart of Drakath's Lair! You'll also be able to check out our shop full of Doctor Who-themed gear AND go on Quibble's quest into simulations of Lore's past, present, and future! Hi guys. As you know, I don't work on AQW anymore but I wanted to share something with the AQW community. Earlier today I got a tweet from a player. Let's call him SKLURP. SKLURP is asking for a little help and I like to help when I can, even thought I don't work on the game. As I'm looking at SKLUP's account I see that it was pretty recently created in a country that is about 10,000km from the country where he is located. Of course that looks suspicious so I start asking questions. SKLURP says that he BOUGHT the account from "some dude" that he met in Battleon because it was higher level than his, already a member and a 5th Upholder. I let him know that he got scammed. He is of course very confused and upset so I let him know how the scam works. For the sake of our example let's call our scam artist ASC4M4T1ST. ASC4M4T1ST starts an account and buys an upgrade. He even uses the ACs from the upgrade to get a few recent rares. SO far, eveything is cool. SKLURP thinks "WOW, WHAT A DEAL!" so he agrees to pay ASC4M4T1ST (maybe through Paypal or some other money transfer service). ASC4M4T1ST hands over the password. SKLURP plays for a few days happily on his shiny new character. Maybe he even buys an AC package to arm him up and make him really nice. THEN, the game auto-detects that this account, which was created in South America is now being played from Asia. Maybe the player just moved across the world so the game checks for a few other things like an e-mail and password being changed around the same time as the new computer started playing this character. 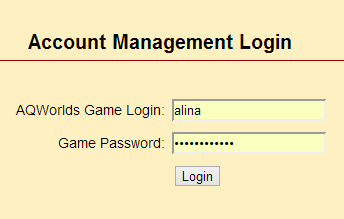 It fits all the critera of a stolen account, so the account is automatically disabled by the game engine. A few days later ASC4M4T1ST contacts PLAYER SUPPORT and says "HELP, I WAS HACKED!". Player Support looks at the account and sees that this upgraded account as created in and upgraded from South America but is being played in Asia. Player Support only wants to help our players as much as possible so they return the account to ASC4M4T1ST, resetting the account to the original creation e-mail and passowrd. ASC4M4T1ST now has control of the account he upgraded, plus the money he got from SKLURP for the account plus the ACs that SKLURP bought for the character while he had control of it. ASC4M4T1ST then repeats the process again. You see, Player Support have no evidence that the account was purchased from ASC4M4T1ST. Even if SLKURP has an e-mail or some sort of recipt from Paypal, it's no help for Player Support. They can't reverse a payment you made in private. In fact, it's ILLEGAL to sell AQW accounts since they are technically all the property of Artix Entertainment. Player Support has no choice but to see thngs this way. The only thing that SKLURP can do is try to get his money back from ASC4M4T1ST. Good luck with that. The Player Support team is doing the best that they can to help everyone out. This is why it's soooo vitally important that people understand that they shouldn't share, trade, give away or especially buy accounts from other players. These items are gone for good! It's Monday, and that means a new week full of battles, gear, and OMG Chaos! To make room for all this awesome new content, though, we're removing some of our previously-released items and events. BattleCon will stay in-game permanently, but the rare shops, Dragon Shinobi farming quests, and Ultra BrutalCorn battle leave! Coming Soon (or already here) in AQW! This Friday: travel into the Chaos Realm to hunt for Drakath, Champion of Chaos! Our previous years' Harvest Fest releases return on Thursday! The Book of Lore has been updated! See which storylines you've completed and re-watch all the Chaos Saga cutscenes you've unlocked! Next week: a NEW Chaos-themed PvP map - get ready to battle each other in the Chaos Realm! Our Doctor Who 50th anniversary shop (and Quibble's timespan quests) will release this Friday! Game testers have begun testing the first round of our anti-botting measures! Soon we'll need YOUR help, too! We are investigating how to do some NEW functionality that we get asked for every day! More news later this week. Take Down Chaos Lord Xiang and her Chaos Harpy! Journey through the Mirror Realm and deep into the heart of a Chaorrupted Forest (/join mirrorportal) where the 2nd Beast of Chaos awaits. Take down the Chaos Harpythen prepare to face the doubly-deadly battle against Chaos Lord Xiang, who wields the combined power of the Good and Evil Twins, Xing and Xang! The penultimate Chaos Lord battle! Survive the Chaos Harpy battle by arming yourself with a Shriekward potion; Alina in Battleontown can teach you how to create one. And then... oh, Hero, and then! Defeat the 2nd Lord of Chaos, Xiang. but be warned: with the Good and Evil sides of herself fighting internally, it's going to be a VERY Chaotic fight as she switches between hurting AND helping you! Chaos Lord Xiang's armor and wings! More gear in the Mirror Realm merge shop! Quibble Coinbiter is back... with Chaos! 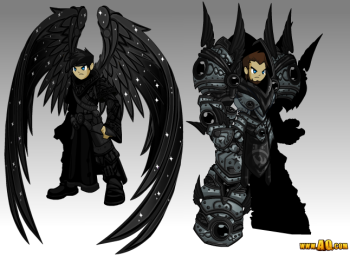 If you've seen Quibble appear before, you know he brings incredible gear themed after the next Chaos Lord Saga... and since we only have ONE left, that means his gear will be Chaos-themed! Arm yourself in the gear of a Chaos Reaper, and check out a full list of the rest of the incredible gear he's got for you! Will you join in the Chaos... or destroy it?! 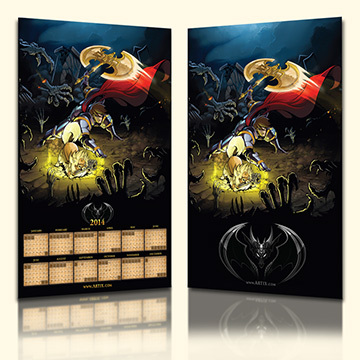 Mark your calendars, Heroes, and if you don't have one for 2014, check out our newest 2014 AE Poster Calendar at HeroMart! Shops and Gear Arrival and Departure Dates! ALL of our Mogloween content leaves Monday, November 18th! 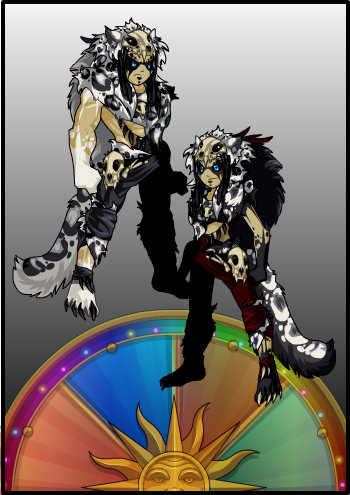 The Snow Leopard and Dark Snow Leopard leave the Wheel of Destiny on Monday, November 18th! The Thor's Day shop leaves this Thursday, November 21st! The previous years' Harvest Fest releases all return next Thursday, November 21st! Memet, Zazul, and Doctor Who are all celebrating Birthday/Anniversaries next week! 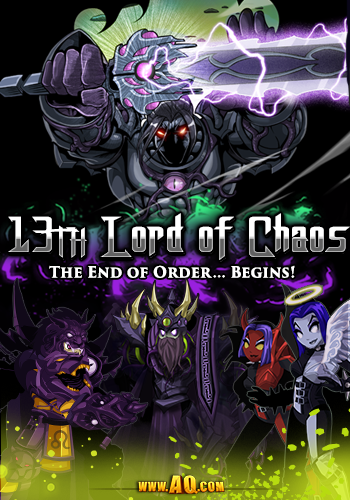 Next Friday: journey into the Chaos Realm to meet the 13th Lord of Chaos... AND discover more of Drakath's plot as the 13th Lord of Chaos Saga begins! Don't miss our high-level, high-EXP farming zone in /shadowrealm! Must be level 45+ to enter! XP caps for levels 49-53 have been adjusted to make leveling easier! 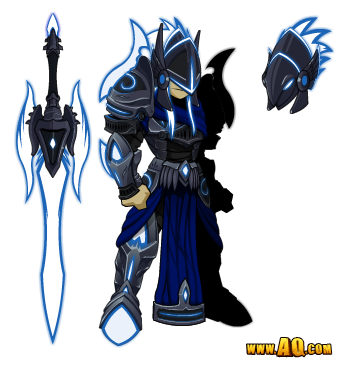 Tomix's Soulweaver armor is now in the DragonFable gear shop and WILL NOT go rare! Don't miss the new swag at HeroMart: our 2014 Calendar AND the Artix Glow-In-The-Dark Logo T-shirt! Guild Halls are now available to ALL players on ALL servers! 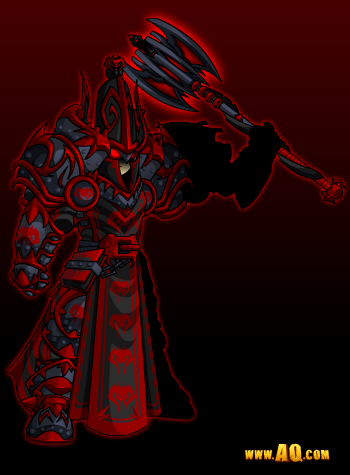 This Friday: Defeat Chaos Lord Xiang! Journey through the Mirror Realm and deep into the heart of a Chaorrupted Forest to find the Chaos Portal... where the 2nd Beast of Chaos awaits. Take down the Chaos Harpy, then take a moment to reflect on whether you're ready to face the doubly-deadly battle against Chaos Lord Xiang, who wields the combined power of the Good and Evil Twins, Xing and Xang! Good and Evil combine to form... CHAOS! If you're going to survive the Chaos Harpy battle, you're going to need to arm yourself with a Shriekward potion, and there's only ONE person on Lore who knows how to make THAT! Once you've taken down the Harpy, prepare to face the 2nd Lord of Chaos, Xiang. But be warned: made up of both Good and Evil Chaos Twins... she may attack you with one hand while defending you with another. Get ready for a VERY Chaotic fight! 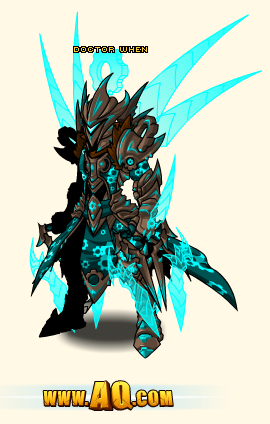 If you've seen Quibble appear before, you know he brings incredible gear themed after the next Chaos Lord Saga... and since we only have ONE left, that means his gear will be Chaos-themed! Even the Shadowscythe are prepared to face Chaos! Midnight tonight: the rest of the Luck of the Draw winners receive their prizes!